Graphic Materials consist mainly of 35 mm color slides shot by Lewis Koch, documenting folk artists, folk art works, and the process of creating those works. Also included are 35 mm color slides by James P. Leary and Janet C. Gilmore, prints used in the exhibit, other photo documentation used for the catalogue or exhibit related materials, floor plans, display case specifications, and 2 VHS videorecordings, one celebrating the diversity the exhibition showcases, and the other a sponsor thank-you video. 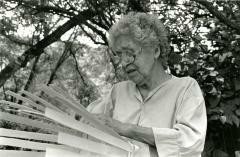 Bertha Blackdeer weaves a black ash basket, 1993. Photograph by Lewis Koch.